The mere fact that Bolton has been a recent frequent guest at the Trump White House and that Trump reportedly values Bolton’s advice, is a threat to global peace. Bolton wants the United States to declare the Muslim Brotherhood a terrorist organization and supports Trump’s backing of the Saudi Arabian and United Arab Emirates embargo against Qatar as punishment for its ties to both the Brotherhood and Iran. Bolton also wants added to the US terrorist list Iran’s Revolutionary Guard Corps (IRGC). Bolton is on record as favoring the creation of a new “secular” Sunni state in Iraq that would be bankrolled by Saudi Arabia. The new Sunni state, in Bolton’s view, would stymie the creation of a Shi’a arc of control extending from Iran through Iraq to Syria and Lebanon. On the issue of Palestine, Bolton has demanded the abolishment of the U.N. Relief and Works Agency (UNRWA), which administers aid programs for Palestinian refugees. In May 2017, before accepting the Guardian of Zion Award from Bar-Ilan University in Jerusalem, Bolton told The Jerusalem Post that the “two-state solution” of Israel and an independent Palestinian state should be abandoned, Hamas, Fatah, and the Palestinian Authority disbanded, Gaza given to Egypt, and the West Bank divided between Israel and Jordan. Bolton cynically said he believes in a “three-state solution” with Israel, Egypt, and Jordan taking control of current Palestinian territory. While representing the Bush administration at the U.N., Bolton and his chief adviser Grenell were known for coordinating all of America’s votes on Middle Eastern matters with the Israeli delegation. Bolton’s world view is to turn the clock back to the 1950s and the “containment” policy advanced by Secretary of State Dulles. In the 1950s, “containment” meant containing the Soviet Union. For Bolton, containment now applies to boxing in Iran, joining Turkey in defeating the Syrian Kurds because Bolton believes they are linked to a “Marxist” Kurdish party in Turkey, and seeking the overthrow of the Assad government in Syria. That Bolton has gotten the ear of Trump, whose world view is a mile wide and a half-inch deep, should trouble the Middle East, South Asia, and beyond. 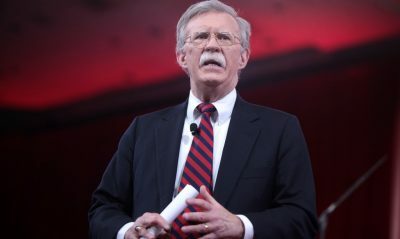 In yet another hearkening back to the days of Dulles, Bolton has promoted an updated version of the discredited “domino theory” for the Western Hemisphere. President Ronald Reagan tried to convince the American public that if the Sandinista government was permitted to take root in Nicaragua, El Salvador, Guatemala, Honduras, and soon, Mexico, would fall to the Communists. Reagan warned that the Communists could then take over the US-Mexican border town of Harlingen, Texas because it was two-day’s driving time from Nicaragua. Bolton served in the Reagan State Department alongside such neocons as Elliott Abrams, the Assistant Secretary of State for Inter-American Affairs and the person behind Reagan’s “Communists in Harlingen” nonsense. It was also a so-called “domino theory” that was promoted by Bolton’s hero, Dulles, and his Cold War successors as Secretary of State to defend US military intervention in Southeast Asia to prevent Communism from spreading from China and North Vietnam to Thailand, Malaysia, and, eventually, even Sydney, Australia and Honolulu, Hawaii. Bolton views the instability in Venezuela as a prelude for such anarchy spreading to Colombia and throughout South and Central America. Bolton believes that Cuba and Nicaragua are working hand-in-glove with Venezuela to destabilize Latin America and the Caribbean. Bolton opposed the normalization of US relations with Cuba and he supports Trump’s downgrading of those ties. Of course, Bolton fails to mention that it was under the Bush administration that repeated US attempts to destabilize Venezuela began and they never ceased. Bolton would rather see Venezuela fall under the control of a right-wing autocrat, such as those who gained power in Brazil, Argentina, and Chile from progressive presidents. Bolton actually believes Iran is exploiting the political turmoil in Venezuela to gain access to the country’s uranium deposits. He also is convinced that Hezbollah has established a drug-running network in Latin America. Bolton has called on Trump to reassert the arcane Monroe Doctrine – proclaiming the Western Hemisphere as America’s domain – because of “Russian meddling” in Latin America. Bolton’s predilection for such conspiracy theories, while welcomed and highly sought in Republican Party cuckoo land, are not the product of sober intelligence analysis of world events. John Bolton, a dangerous madman, certainly has no place in any White House, particularly one that is already led by someone who is mentally unhinged.